Yamaha says sport-touring is its most booming segment lately – responsible for more than 70% of its sales. And the Tracer 900 GT (new in the US market) makes up 64% of that. It also says that since introducing the Niken three-wheeler last spring, and having given test rides to over 5,000 riders, even the skeptical have been convinced; now everybody realizes the benefit of having two front contact patches. Well, enough people to make it profitable, anyway, Yamaha seems to think. Adding two and three, Yamaha came up with Niken GT. 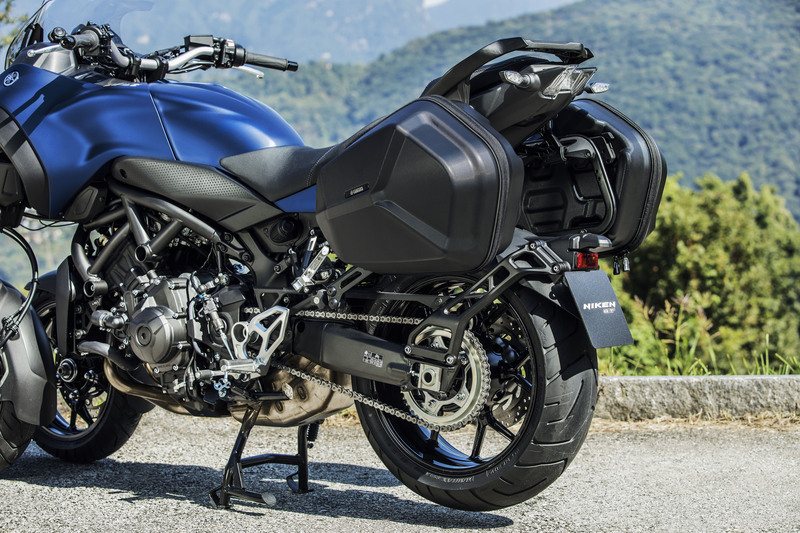 Thanks to that extra traction in dicey conditions, Yamaha rolled the new Niken GT onto the stage in Milan to the strains of Vivaldi’s Four Seasons. This one’s designed to be an all-season sport tourer, complete with hard bags, a bigger windscreen, and all the things you need for all-weather travel. I know I was impressed by how nice and stuck to the cold and sometimes wet pavement the Niken felt when I got to take one for a spin earlier this year. 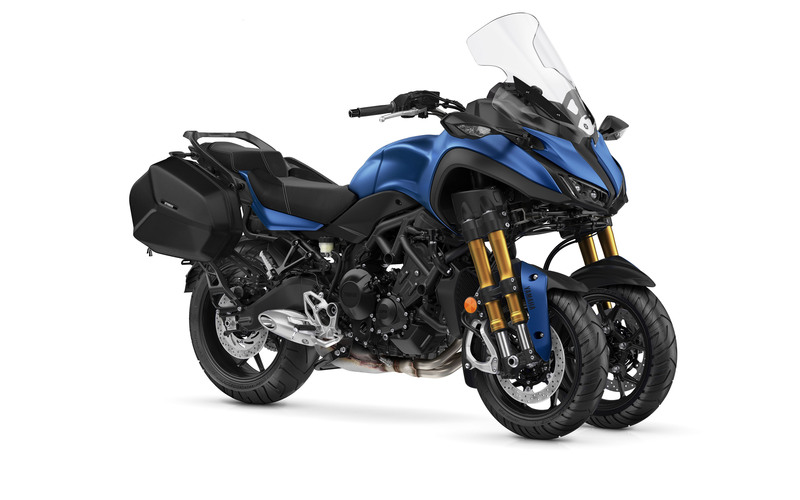 Cypress, CA – November 5, 2018 – Yamaha Motor Corporation, USA (YMUS), today introduced the NIKEN GT Leaning Multi-Wheel (LMW) motorcycle as a more touring-focused version of the previously released NIKEN. Featuring a pair of locking quick-release 25-liter ABS side cases, a wider and taller touring windscreen, comfort seat, heated grips and more, the new NIKEN GT offers riders the pleasure of cornering confidence combined with comfort and convenience for longer rides. 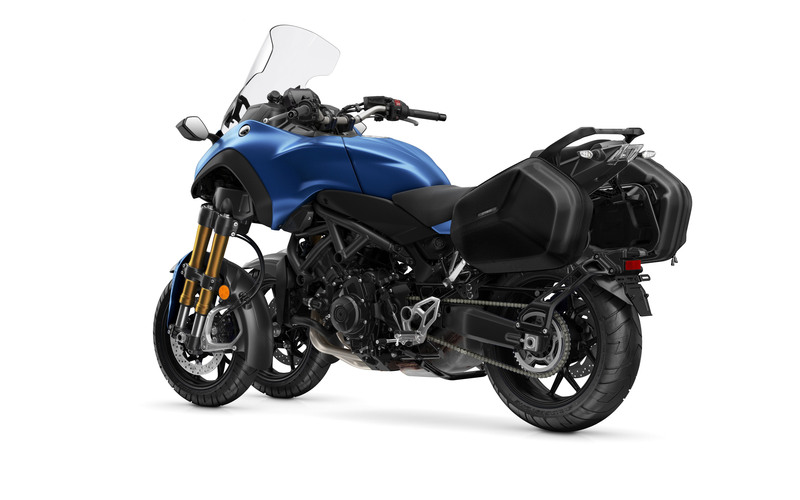 The popular FJR1300A and FJR1300ES motorcycles were also revealed, joining the previously introduced Tracer 900 and Tracer 900GT models, to complete the company’s 2019 Sport Touring lineup. The introduction of the radical NIKEN LMW motorcycle brought a whole new riding experience to the motorcycle world. Equipped with innovative Leaning Multi-Wheel technology and dual-tube upside down forks, the NIKEN is built to deliver the most amazing corner carving experience together with higher rider confidence in all conditions. With a larger contact patch between the tires and the road surface, the two leaning front wheels give increased levels of front-end grip that is particularly noticeable during cornering and braking. It is this unique and dynamic characteristic of the NIKEN that makes it feel and handle like no other motorcycle. With its proven ability to deliver the most exciting corner carving experience, this unique motorcycle is introducing a new era in Sport Touring design. The NIKEN’s Leaning Multi-Wheel concept is designed to master adverse conditions, making it ideally suited to all-weather, four-season riding on the most challenging mountain roads. Fitted with a range of specialized equipment, the new NIKEN GT brings added functionality to the LMW concept by offering increased long-distance touring capabilities together with elevated levels of rider and passenger comfort. The NIKEN GT’s wider and taller touring windscreen gives greater upper body protection from the wind and weather, and the specially designed comfort seat enhances the sport touring experience for both the rider and passenger. Premium quality quick-release 25-liter ABS side cases are light, compact, lockable, and easy to handle. For added convenience, the rear of the carrier base features integrated passenger grips. Heated grips ensure riding comfort in all weather conditions, while the all-LCD instrument display keeps the rider informed of the warmth level. There’s also an extra 12-volt outlet to power or charge various electronic devices. The NIKEN GT model also comes fitted with a centerstand that facilitates convenient parking, chain maintenance, and tire inspections on longer trips. With its innovative LMW design and radically styled bodywork, the NIKEN GT is always going to be the center of attention wherever it travels. The NIKEN GT will only be available through Yamaha’s online reservation system, and customers who reserve online will receive their motorcycles from authorized Yamaha dealers for the suggested retail price of $17,299 beginning in March 2019. Featuring a Matte Phantom Blue color scheme, the 2019 NIKEN GT will have limited availability. Yamaha encourages interested customers to visit their online reservation website soon for first come, first served reservation confirmation and delivery. To reserve online, visit https://www.yamahamotorsports.com/sport-touring/campaign/nikengtreservation.